We will be booking a club stand for the Sunday, please let me know if you would like to attend. Booking are open for the show. Advance tickets are £10 per day, I've booked a club stand for the Sunday. 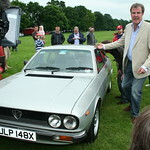 It's open ,to all pre 1998 Lancia's plus any interesting Italian car.